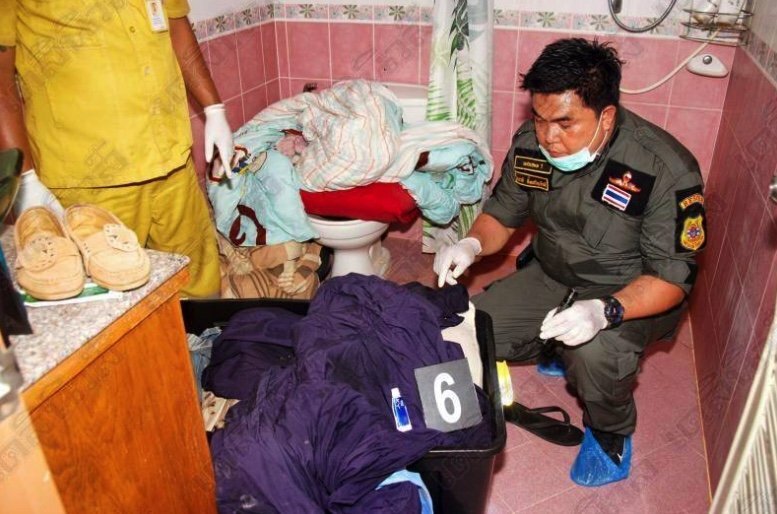 Police in Hua Hin said that the 39 year old woman found brutally murdered and stuffed in a plastic box at a house in Hin Lek Fai sub-district was killed by a man of mixed Swiss/Thai parentage. After committing the murder he fled on a motorbike and was being hunted by police. Daily News reported that he called his wife to apologize then committed suicide by lying on the railway tracks in front of a train in the Bang Sai Yoi area of Cha-Am. He had worked in a hotel in Hua Hin. The woman found stuffed in the box in the toilets of the rented house in Ban Phutawan Soi 5 had been stabbed many times in the neck. She was named as 39 year old Suchaphat Hiranphanthachote or "Kai" from Prawet in Bangkok. She worked as an online maid and was known to be the girlfriend of the man suspected of murdering her. He was named as 28 year old Dithawat James Dross (name transliterated from Thai). Prajuab Khiri Khan police chief Maj-Gen Surasak Suksawaeng said that Dithawat had called the victim last Tuesday to come and meet him at the house. She arrived in a car that was found outside. An argument developed. Maj-Gen Surasak said it was unsure whether this was over jealousy or the woman was trying to end the relationship. The man already had a wife. Surasak said it appears he stabbed the woman to death and put her in the plastic box in the toilet. Then he locked up the house and went to work as if nothing had happened. But police investigation put him under increasing scrutiny that led to him committing suicide on the tracks. Daily News said that Dithawat had called his wife to apologize. The wife refused requests for an interview.